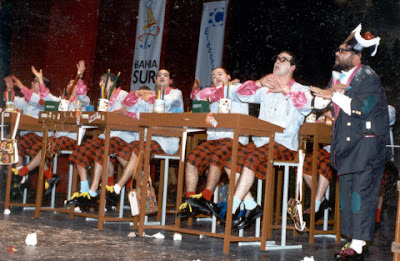 1996-Chirigota "Una Chirigota con clase"
¡HASTA LAS MISMA TRANCAS CADIZ! NI AL DERECHO NI AL REVES ¿ESTO QUE ES LO QUE ES? YO SOY EL REY Y AHORA ¿QUE? MAS BONITA QUE NINGUNA, 2º DE E.S.O. SEVILLA TUVO QUE SER, "MI ARMA"
¿DRAGONES Y MAZMORRAS? ¡QUE NO JOSEFA,,BALCONES Y COTORRAS!